This is the second article in a series devoted to aspects of composers works and lives not generally known by average concert goers. Perhaps these sketches will encourage readers to dig further into the life and times of other composers. Who was the first Western composer to write col legno for strings, the first to write in multiple keys simultaneously, the first to employ what is known today as a “Bartok pizzicato” and which composer first thought of weaving paper among the strings of a bass viol? Not too long ago I would have answered in order, Hector Berlioz, Charles Ives, Bela Bartok and maybe Henry Cowell. Now that I’ve discovered the works of Heinrich Biber , a man music historian Charles Burney named as the best violin composer of the 17th century, I know better.1 The discovery wasn’t my personal Olduvai Gorge, but it was an Ah Ha moment that made me re-evaluate aspects of my music school education. The music of Heinrich Ignaz Franz Biber von Bibern expunged a trove of old ideas from my mind and led me on a delightful voyage of discovery through music of the late 17th century hitherto unknown to me. Heinrich Biber is regarded by violinists, particularly aficionados of early music, as one of the most important composers for the violin in the history of the instrument. His technique allowed him to employ multiple stops in intricate polyphonic passages, and explore the various possibilities of scordatura or retuning.2 He also wrote one of the earliest known pieces for solo violin, the astonishing “Passacaglia”.3Paul Hindemith (1895-1963) proclaimed Biber the best Baroque composer prior to J.S. Bach. As Biber’s other works had not as yet been discovered or printed, Hindemith’s evaluation was made solely on the strength of the “Rosary” or “Mystery Sonatas” (1676) which were unknown until their publication in 1905. After first hearing Biber’s “Passacaglia”.4 I began to explore his music further. Therein I discovered his “Battalia” or Battle music and the 17th century infatuation composers had with war and the sounds of battle. All this more than100 years before the most famous, or infamous work in this genre, Beethoven’s “Wellington’s Victory” wherein Beethoven employed antiphonal bass drums, snare drums and wooden ratchets which simulated the cannonade, the march of soldiers and the rapid fire of muskets. If Biber was not the first to hit strings with the wood of a bow or compose a work in eight simultaneous tonalities, or ask for pizzicatos forceful enough to snap the finger boards or weave paper around bass strings, he was way ahead of the guys my teachers had credited with first doing these things. And all of those sounds Biber put in one work, “Battalia à 10” written in 1673. Having the sound of musket and canon imitated by stringed instruments alone, Biber creates a battle experience more stimulating to one’s imagination then the literalism of Beethoven’s “Wellington’s Victory”, a television versus radio comparison if you will. 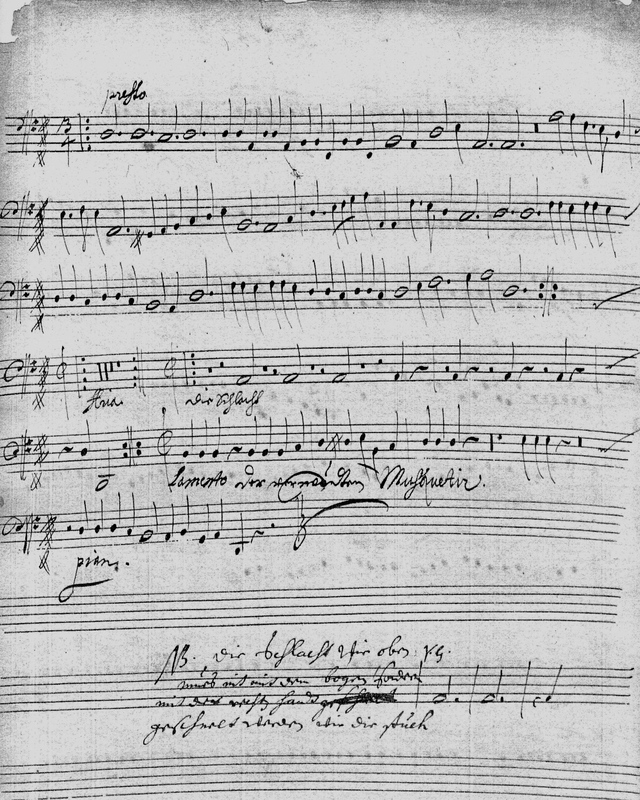 Biber’s “Battalia à 10” contains the following eight movements: “Sonata” (col legno), “Die liederliche Gesellschaft von allerley Humor” (in eight tonalities), “Presto”, “Der Mars” (violin solo and bass viol prepared with paper and played col legno), “Aria”, “Presto” (Bartok pizzicatos), “Der Schlacht”, “Lamento der Verwundten Musquetierer” (lament for the dead soldiers). As suggested earlier, Biber was not the only composer to delve into the 17th century’s infatuation with the Art of War. In fact, the genre appears to have begun in Italy during the 16th century. A more immediate predecessor of Biber was Carlo Farina (ca 1600-39), who in his “Capriccio stravagante” (1627) presages some of Biber’s compositional devices, with the use of folk tunes, short movements alternating fast and slow tempi, drones ala bagpipes, sudden extremely discordant outbursts, simultaneous glissandi in various keys and col legno. One commercial CD I highly recommend for those interested in exploring the military genre of the 16th and 17th century is ‘batailles”, with La Bande Montreal Baroque and Concerto Palatino. This disc includes eleven works devoted to battle music written between 1557 and 1673. The performances are superb. (Also of interest is the sound and fluidity of Baroque trumpets played by Concerto Palatino.) This recording includes the Biber “Battalia à 10”. A Jordi Savall CD is titled “Biber,Battalia à 10” also contains Biber’s “Requiem à 15 in Concerto”. There are also two other CDs of distinction. Both Biber’s fifteen “Rosary” or “Mystery Sonatas” 5 and eight other violin sonatas and “Romanesca” were recorded by Andrew Manza. Both two CD sets deserve a hearing, or two or three. When one hears these works one cannot help but compare them to Bach’s Sonatas and Partitas written a half century later. Heinrich Ignaz Franz Biber von Bibern, baptised, Wartenberg (Stráž pod Ralskem) 12 August 1644 – died Salzburg, 3 May 1704. 2. 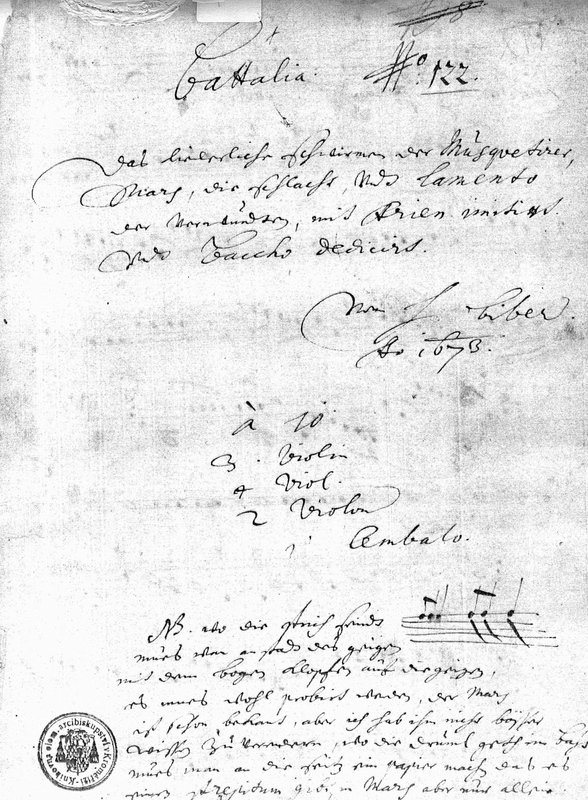 The tunings used by Biber in his “Rosary”” or “Mystery Sonatas”. With these tunings, a violinist fingers the passages as normally, but other notes sound. 3. 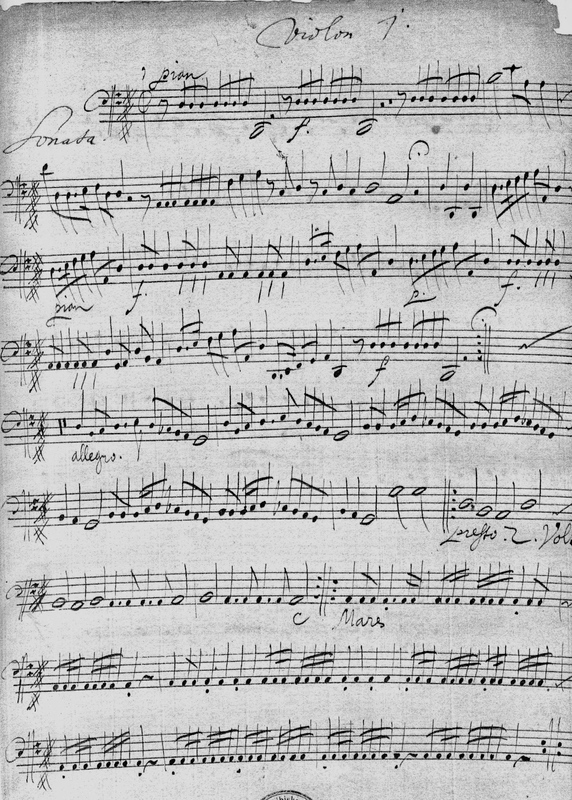 Biber’s unaccompanied Passacaglia concludes the Rosary Sonatas and was written in 1676. The three sonatas and partitas for solo violin by Bach were completed in 1720. 4. The name “Passacaglia” is derived from two Spanish words Pasar ( to walk) and calle (street). In the first quarter of the 16th century Giroloma Frescobaldi refined the form. Later he invented the Chacconne. A triple metre and bass ostinato are now considered two characteristics of both. 5. Biber’s sixteen “Rosary Sonatas”, each with its own name, are in three contiguous groups of five sonatas called Mysteries: “The Five Joyful Mysteries”, “The Five Soulful Mysteries”, “The Five Glorious Mysteries” and end with “Passacaglia for Unaccompanied Violin”. The entire set is titled “The Rosary Sonatas”. The first Sonata is called “The Annunciation” and the fifteenth, “The Beatification of the Virgin”. A comparison of the Biber and Bach sonatas is enlightening. It is also worth noting that Leopold Mozart (1718-87) published his famous “Violin School” in 1756, 83 years after the “Rosary Sonatas” and 52 years after Biber’s death. Bass violon part to Mars, page 2. Bass violon part to Mars, page 1.